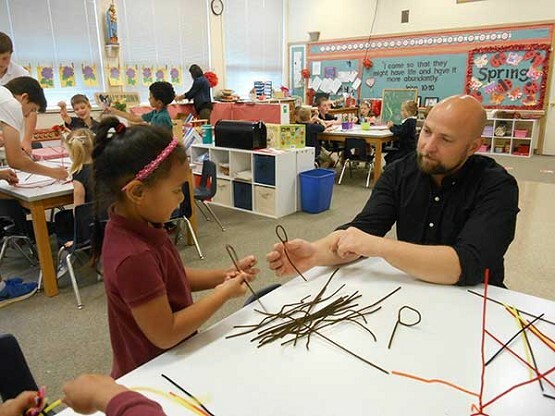 Tifa Panapa, a preschooler at O’Hara School in Eugene, works with science teacher Clint Larson. Larson was named a top instructor in a national competition. EUGENE — The Air Force Association has named Clint Larson, a science teacher at O’Hara School, as the 2016 Oregon Science, Technology, Engineering and Math Teacher of the Year. The recognition goes to outstanding teachers throughout the United States. Larson will be considered for the national award, which will be announced in September. Larson has been the middle school science teacher at O’Hara for seven years. He can often be found in one the primary classrooms leading STEM projects with the younger students. An active National Science Teachers Association Larson picked up on the STEM movement in education at the association’s national conference in Seattle seven years ago. O’Hara uses Larson as a STEM specialist not only to work in classroom settings, but also to train fellow teachers on effective STEM methods and incorporation into curriculum. Larson completed his undergraduate and graduate studies at the University of Oregon and has been teaching for more than 12 years. Representatives from the Air Force Association were in attendance at O’Hara’s staff meeting June 8 to present the award.